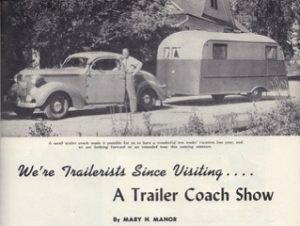 Vintage Trailer Camp > Historical / News > Trailers in 1949 . . . 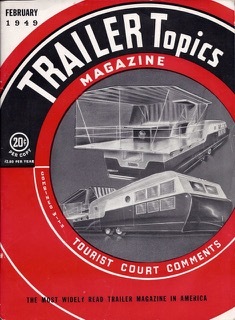 According to the magazine, all trailer coach manufacturers in 1949 were invited to send their specifications in to TRAILER TOPICS. All those sent in were listed. 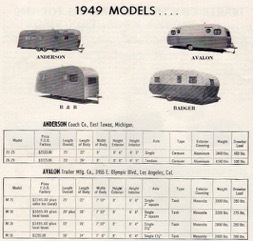 In addition to the location (address) of manufacture, just basic specifications were included that would enable one to compare values and prices. Some trailers were highlighted in paid advertisements within the magazine and many were not . . . 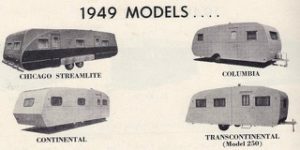 The trailer listings included prices of most, overall length, body length, body width, exterior height, interior height, axle, type, exterior coating, weight and drawbar (most of the time). This picture accompanies an article on pp. 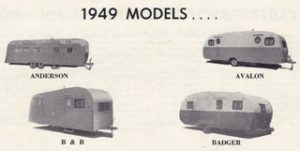 11 & 103) . . .